It’s only 5 ingredients and in the “easy & delicious” category, it’s a 5-star. This Guacamole Salsa Chicken Enchilada Casserole could be a new go-to favorite because one jar of a store bought savory sauce does pretty much all the work! Herdez Guacamole Salsa is one of the newest products in the Herdez family of salsas and I’m happy to have stumbled upon it because of this recipe. You may have seen it on grocery store shelves and wondered what to do with it. 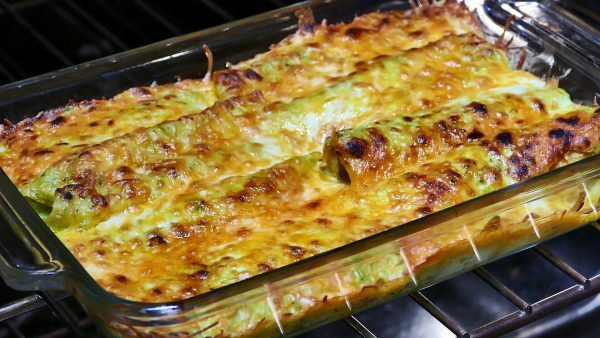 This enchilada recipe is the perfect place to start. The guacamole salsa is a rich and creamy blend of avocado, tomatillo, chiles and spices with a bit less kick than most salsas but the flavor is all there! All you need is a jar of this special sauce, some corn tortillas, rotisserie chicken, some cheese and cream and in about 20 minutes you’ll have a fantastic meal! It’s as easy as it gets, but if you want to take the dish to a new level of flavor, I’ve added an additional recipe for homemade tortillas. Es delicioso! Watch my how to video for Guacamole Salsa Enchiladas here! Want to make your tortillas from scratch? Try this easy recipe! In a bowl, whisk together corn meal, flour, egg, water and salt. (Batter should be consistency of thin pancake batter. Add more water if needed.) Heat a small amount of oil or cooking spray in a small cast iron skillet or crepe pan. With a ladle measuring cup, pour a thin layer of batter in pan to make a 6 inch tortilla. When tortilla forms bubbles, flip and cook for about 30 seconds. Put on place and cover with towel to keep warm. Repeat until batter is used up.